I'm not doing too well with my blogging lately, it seems. Too much going on! Kenny and I have been getting out when we can to enjoy the beautiful fall colors. Unfortunately, many of the trees are just drying up and dropping their leaves here in Oak Ridge. Last week I taught at a school in Gatlinburg, so we spent the night before at a motel. After my classes were over, we drove back to Oak R idge through the Smokies. We saw some nice trees along Little River Road. Thanks to all the stimulus money the park received, there have been some badly-needed improvements done to the park roads and parking areas. 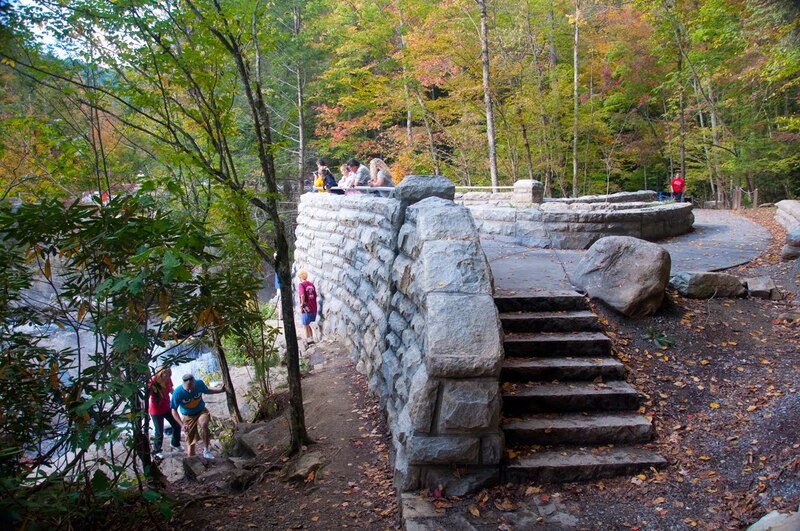 The Sinks is a very popular roadside waterfall, it received a new parking area and a nice observation deck. Our last stop was to the Foothills Parkway, just outside the Smokies. 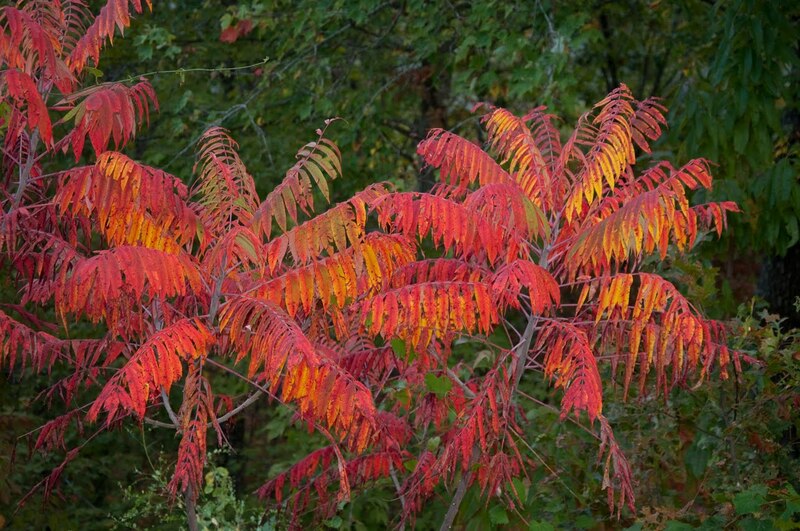 I was amazed at the brilliant colors of t he Smooth Sumac leaves, they reminded me a bit of psychadelic palm trees! The smooth white bark of the Sycamore trees contrasted so beautifully with the russet leaves of a nearby Sweetgum tree. 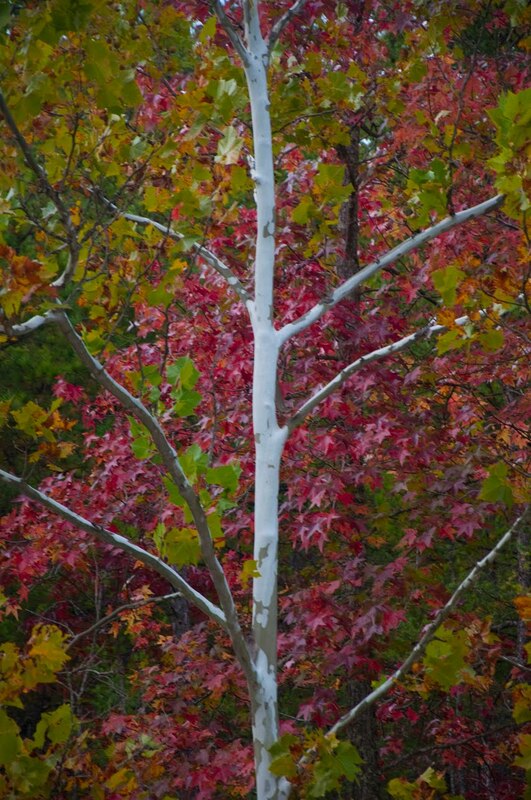 The Native Americans called sycamores the "Ghost Tree" because of the white bark. These trees shed their bark in long strips, there is little or no rough bark near the top of the crown. They often grow near streams and rivers, so this one seemed out of place near a ridge top! 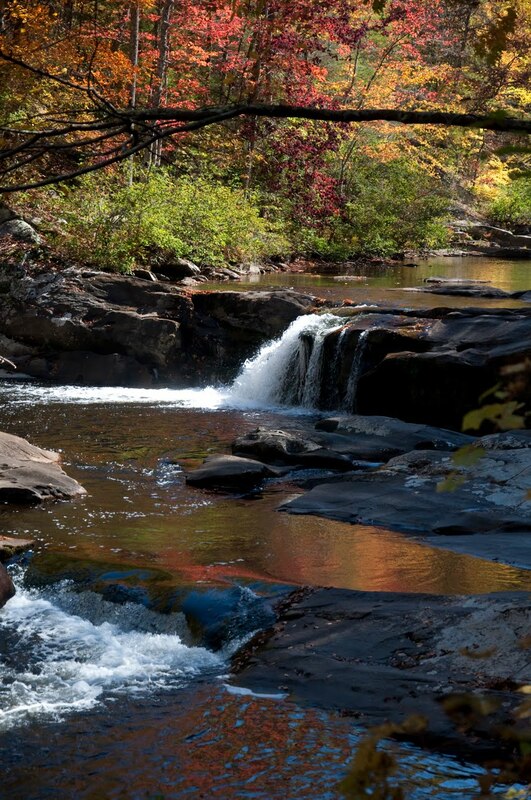 On Thursday Kenny took another day of vacation and we drove south t o the Cherokee National Forest in Te llico Plains, TN. I wanted to get some photos of the trees and reflections along the river. I was not disappointed! :) When we got to Bald River Falls, the parking lot was full. The light was lousy then anyway, so we drove 1/4th mile or so up the road to Baby Falls. Since the water was so low, I was able to walk out into the river on the moss-covered rocks (they weren't slick, it was like walking on carpet). 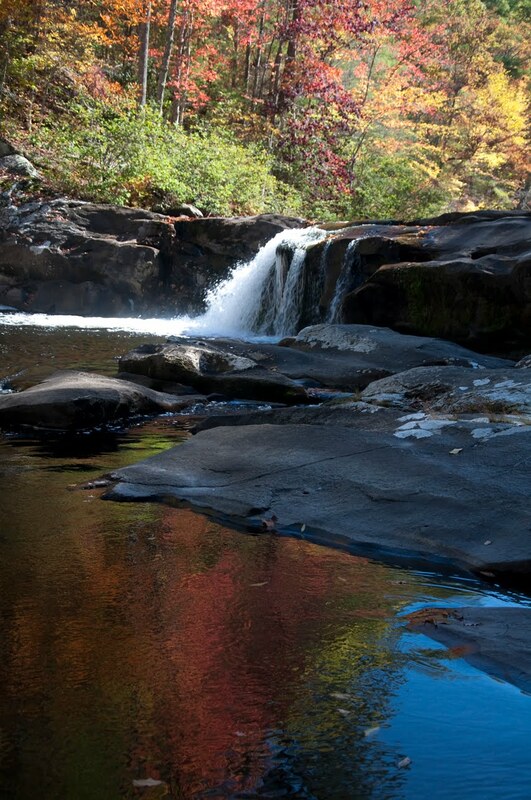 On previous trips, we have seen people kayak over and jump off this little waterfall. The water and pebbles have made some interesting "carvings" in the soft shale rocks in the riverbed. 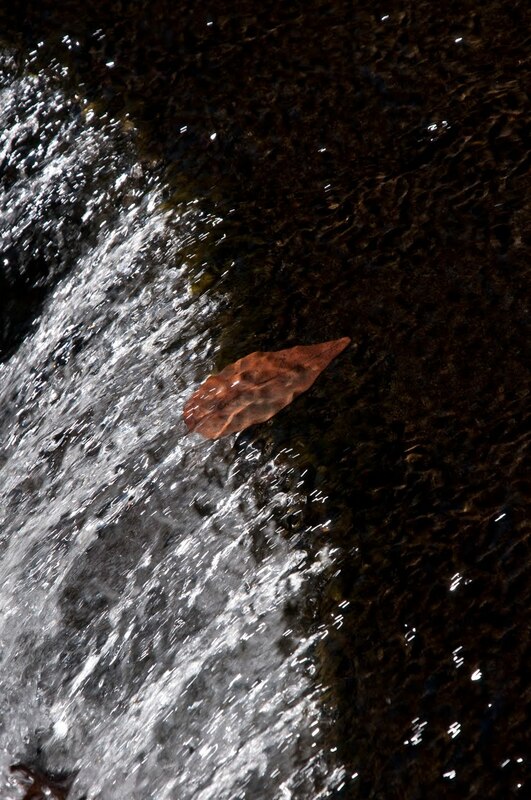 I liked the submerged leaf that had caught on some moss (yes, it was moss, not algae). A little farther upstream we came across another pretty little waterfall, I don't know if it has a name or not. The reflections of the colorful trees on the still water below were gorgeous! We finally made it to Bald River Falls, but the direct overhead light made for not-quite-optimum conditions. It is a hard waterfall to photograph because it is either in shade or blown out by direct sun due to its east - west orientation. This is a very easy waterfall to get to, I was standing on a bridge when I took this photo! That is one reason it is so popular, it doesn't require a strenuous hike to go see it like many of the others in that area. After a quick stop at Indian Boundary Lake, we headed o n up the Cherohala Skyway. 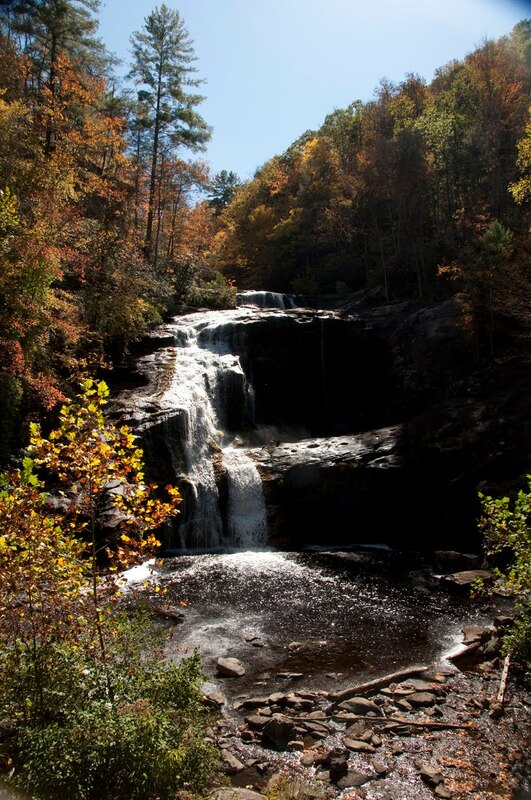 "Cherohala" is a combination of the two national forests where it is located; the Cherokee on the Tennessee side and the Nantahala on the North Carolina side. The leaves were breath-taking up at about 3000 feet in elevation. We were amazed at the variety of colors! 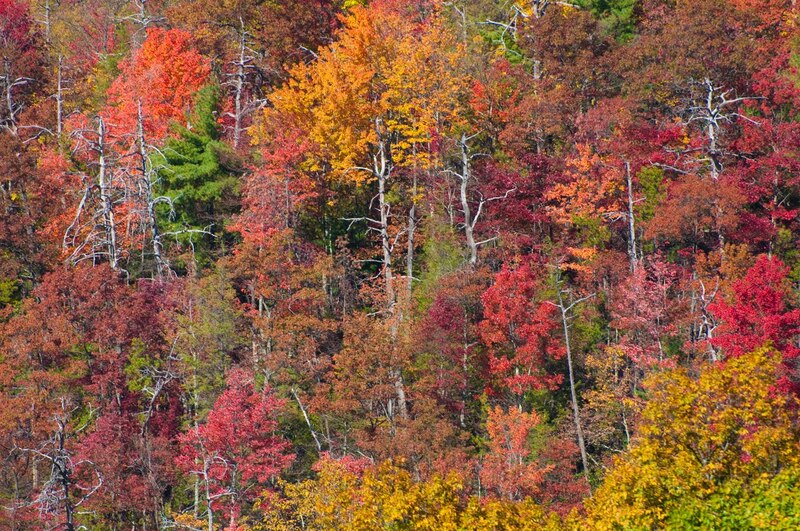 Sights like this could give New England autumns a run for their money! Our last part of the adventure was a drive down Hwy. 129, a.k.a "The Tail of th e Dragon", an 11-mile stretch of highway with 318 curves! 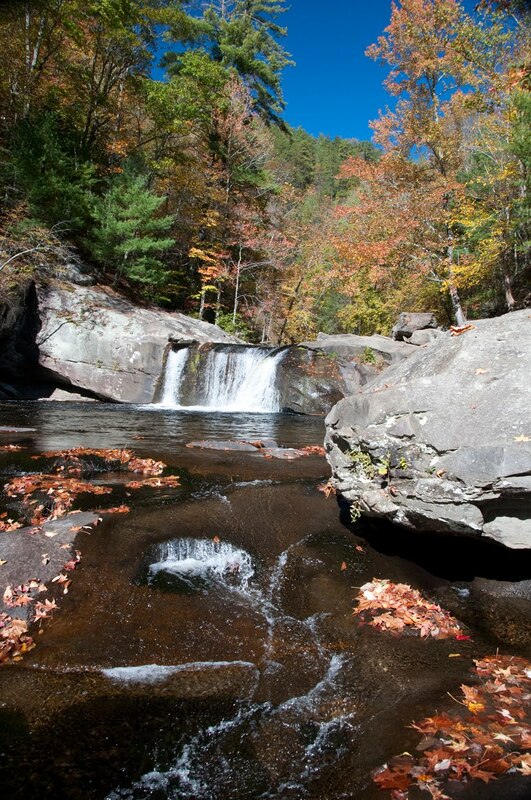 It borders the Smokies and is very popular with motorcycle drivers. It begins at Deals Gap in North Carolina and ends at Hwy. 411 near Maryville, Tennessee. When we stopped at the "motorcycle resort" (I question the word "resort", the place had bunkbeds!) 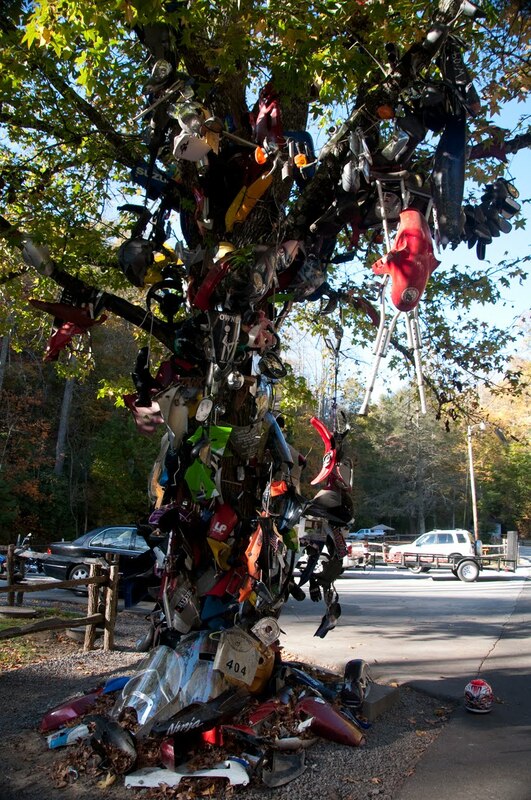 at Deals Gap, we saw the "Tree of Shame". The trunk and lower branches were covered with pieces of motorcycles that had been involved in crashes, and memorials to riders who did not make it back. We met two riders from Toronto, Canada, one fellow laughed when he found his mirror on the tree that he lost in a 2003 crash. Here are a couple of the curves we encountered!